From the rapids on the Lehigh River to the flat water of Lake Wallenpaupack, you’ll find lots of places to enjoy kayaking, canoeing, rafting, and stand-up paddleboarding. Boasting 150 lakes and 170 river miles, the Pocono Mountains is an incredible spot for water-sports enthusiasts. Outfitters and gear rental shops make it easy for paddlers of any ability to get on the water and enjoy the incredibly scenic surroundings. Here’s a quick glimpse of some of the paddling options you’ll find in the region. Paddle through the Pocono Mountains’ most famous sight, the Delaware Water Gap, a mile-wide chasm between Mount Minsi and Mount Tammany. 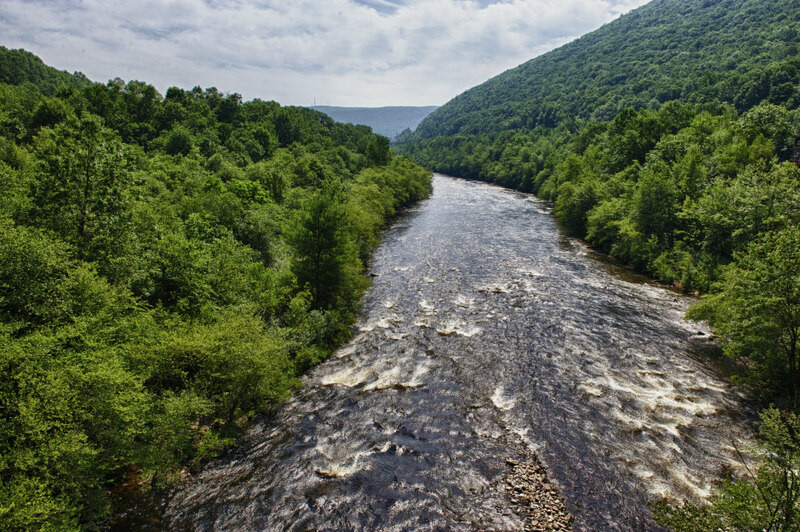 Canoeing and kayaking are popular in the 69,000-acre Delaware Gap National Recreation Area, and the Upper Delaware Scenic and Recreational River offers some of the Northeast’s most accessible and unspoiled water recreation. Expect calm pools and mild rapids that make it a fun jaunt for even beginner paddlers. Take a raft on the playful waters if you bring kids along. Bringing your own canoe or kayak? Free shuttle service is provided on summer weekends by Monroe County Transit Authority. Boat rentals: Authorized liveries rent canoes, kayaks, and rafts. They bring the boat, paddle, and life jacket to you at the put-in and pick it up at the take-out so you never need to worry about transporting a boat. On Lake Wallenpaupack there’s enough space to spread out and enjoy kayaking, canoeing, or stand-up paddleboarding. 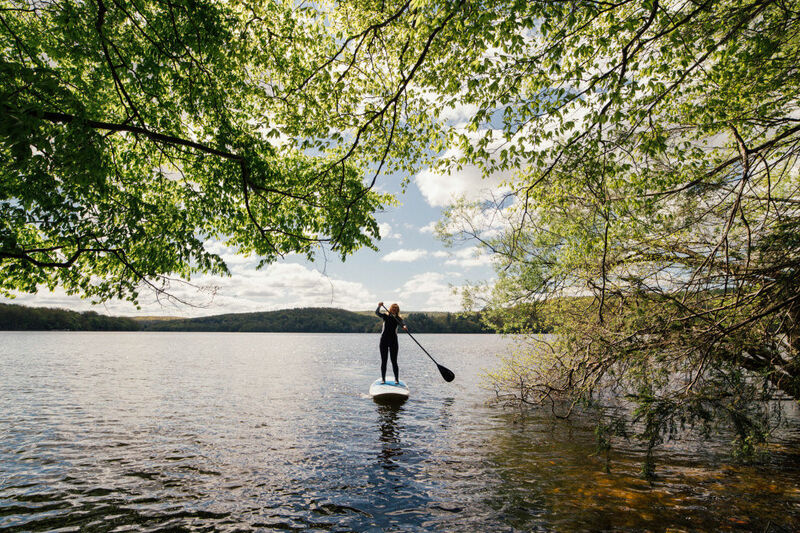 Stretching 13 miles and spanning 5,700 acres, Lake Wallenpaupack is northeast Pennsylvania’s largest lake and the state’s third largest man-made one—making it the perfect place for a long paddle. Located in the town of Hawley, the lake was created as a hydroelectric project—and still generates electricity during high demand times. But today, recreation is king. You’ll see plenty of powerboats here, but lucky for paddlers, there’s enough space to spread out and enjoy kayaking, canoeing, or SUPing without feeling crowded. Boat rentals: Located on the lake’s shore, Wallenpaupack Scenic Boat Tours & Boat Rentals offers single and tandem kayaks or stand-up paddleboards. Rentals are available by the hour or day; life jacket and instruction is included. The shop is open May through mid-September. 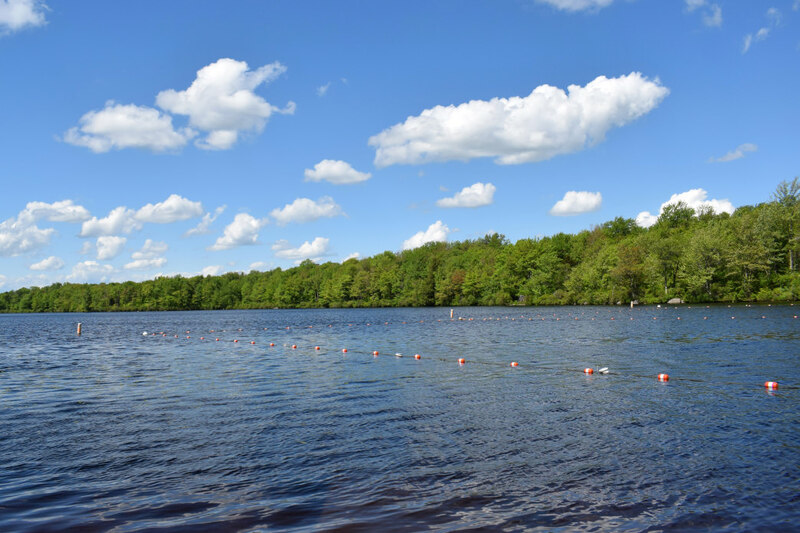 Found in the heart of the Poconos, Lake Harmony is a natural glacial lake surrounded by picturesque summer homes and lush vegetation. It’s a popular spot for kayakers, canoers, and stand-up paddleboarders. Promised Land State Park features two lakes surrounded by the Delaware State Forest. Boat rentals: There’s a shop just west of the swimming beach that rents paddle boats and kayaks throughout the summer season. It’s open daily during the summer. Prepare to paddle Class I, II, and a few Class III rapids on the Lehigh River. Guided tours: Unless you’re a pro, going guided is best on the challenging Lehigh River sections. Licensed guides provide instruction, life jackets, paddles, rafts, and often snacks or a meal—dependent on the trip length. Built originally as a flood-control project, this 345-acre lake near the town of Jim Thorpe, has become a recreation hotspot and welcomes 150,000 visitors annually. Designated for non-powered watercraft and electric motors only, it’s a great place to kayak or canoe without worrying about bigger boats. Boat rentals: The lakeside Mauch Chunk Lake Park Boat Rentals offers canoe, kayak, paddle boat, paddleboard, and rowboat rentals. Located by Boat Launch A, the shop rents every day during the summer season, Memorial Day to Labor Day. This state park features the 290-acre Prompton Lake, which is operated by the U.S. Army Corps of Engineers. You’ll find one boat launch on the western shore of the lake, accessible from PA 170. Motorized boats are permitted (with up to a 10 horsepower motor) as long as they display an up-to-date registration. Non-motorized boats have some options when it comes to required permits. Anglers know the lake as home to crappie, yellow perch, and largemouth and smallmouth bass. There are not boat rentals in the park, but you’ll find lots to do around the lake, including 26 miles of hiking trails (on which mountain biking is also permitted), a picnic pavilion, and an 18-hole disc golf course. A glacier at least a mile think covered the area about 20,000 years ago. Experience the thrill of rafting in the Pocono Mountains.